It is in our PPC Marketing DNA to optimize based on what we are seeing in terms of ROAS% and ROI%. It’s always a “no-brainer” to perform text ad testing, keyword matching options, adding of negatives and optimize landing pages in order to improve conversions. However, when it comes to “Non-Branded” campaigns/adgroups it’s an up-hill battle regardless of how much optimization has been done. In this post, I will discuss the reasons why advertisers should not just TURN OFF “Non-Branded” campaigns/terms because they are actually doing most of the heavy lifting and making the Brand Campaign look like a cash register. We all know that when people do a Google search on a generic term that is related to the advertisers product or service, the odds that it will convert immediately are slim to none. Furthermore, even if a conversion does happen, it will most likely have a poor ROAS% due to competition and higher CPCs. The key issue here is to not look at this as a failure, but rather as an investment to enhance Brand Awareness. Improve social media exposure through Facebook, Twitter, etc…. PPC Marketing is an investment that needs to continually be optimized as well as understood. 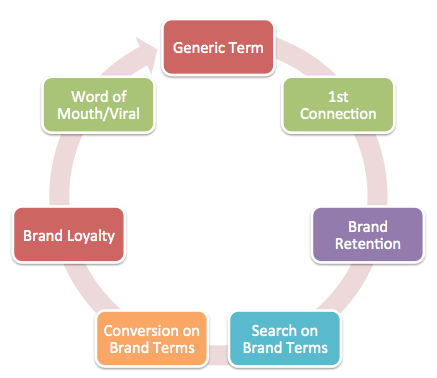 Each advertiser has different levels of “online and offline” Brand awareness, various cost per conversion requirements and overall competition. 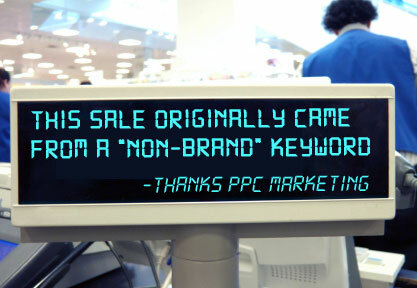 PPC Marketing is not just about putting together a good strategy consisting of “Quality Score” Methodologies. It’s also about looking at data and understanding searching behaviors. Advertisers need to look at Analytics Data in a more holistic fashion in order to paint a clear picture of what is working “on and off” the stage.